Constructed from 15mm diameter tubing with extendible ‘D’ shaped arms, to help prevent twist. Fitted with 3/8” BSF brass inserts. 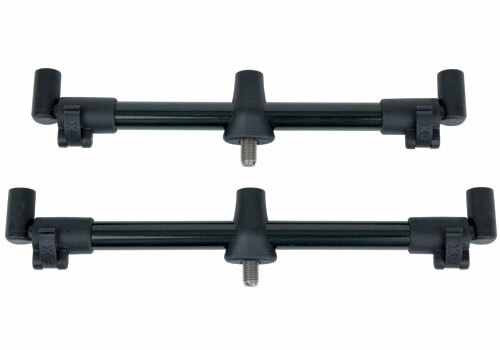 All Buzz Bars can be used in conjunction with a pod or alternatively supported on banksticks. A very useful option when rods have to be placed well out in the water when fishing shallow margins. Further stability can be achieved by using our positive rear rests which are available in three sizes. It seems as if fishing platforms are popular and using a rod pod in these situations is an obvious choice. However some of these can be quite slippery and for piece of mind special bungey elastics have been designed by FOX to anchor the pod to the platform. Such is the choice that you can customise just about every set up to suit individual requirements.